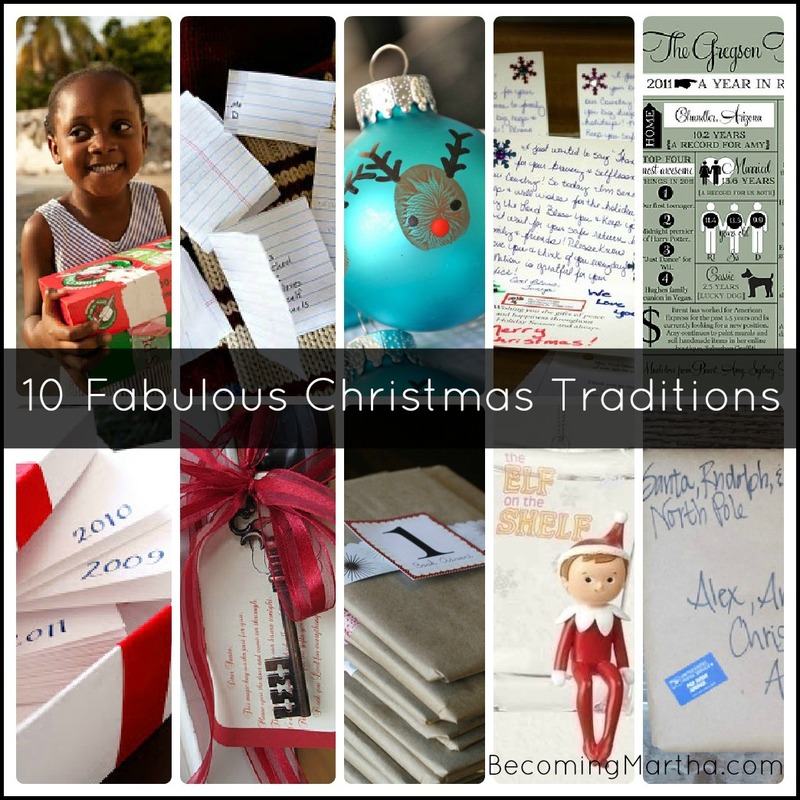 Growing up, I can’t recall too many Christmas traditions… unless you count my dad making us throw the trash away from each gift before we opened another a tradition. (I don’t, I call it being a party pooper, and so do my siblings, Dad!) Don’t get me wrong, we made a ton of memories and had a blast (minus the garbage ritual), but there weren’t too many things we did the same every year. The one I do remember is that every Christmas eve, my sisters and I would squeeze into one bed (the three of us) and my two brothers would squeeze into a bed. We would laugh into the wee hours of the morning, and when we woke after an hour or two of sleep, our mom Santa had always left our stockings at the end of our bed. She He would make sure to put one significant gift in the stocking so that it eased our curiosity back into a a few more hours of sleep. Until we bought our house last year, we were always travelling to see our families at Christmas, and we didn’t get to set those traditions for our own family. Now that we have “planted roots”, I want to set up some fun activities for our kids to do. Last year, we started Elf on the Shelf, which my kids just went nuts over. They love it, and have already started asking when Alfie is coming back. If you have never heard of OCC, you need to get involved. Every year, our church fills about 500 of these shoeboxes to send to children in third world countries and parts of the world who are not as fortunate as we are. This year, my daughters class also filled shoeboxes as a class project. They are filled with goodies and toys, and are usually the only Christmas gift these children receive. It truly is the perfect example of what Christmas is supposed to be all about – giving and sharing and helping others experience joy. What better tradition to start? If you belong to a military family like I do, you know how hard it is to be apart from your family at Christmas. My husband was in Afghanistan during Christmas of 2009, and he said the Christmas cards that rolled in from complete strangers were a total morale boost. They may be soldiers who are supposed to be tough, but being tough when you are alone for Christmas is hard, even for soldiers. So give them a boost, would ya? They will truly, truly appreciate it. Even if you don’t mail them out, family newsletters are a great way to come together and remember all the great things that have happened during the past year. How cool would it be to write one every year, and save them all in a book to look through? Imagine creating a book full of newsletters every year for your children and giving it to them to continue with their own families? Super cool! And it doesn’t have to be fancy and graphic like the one above… you can find free newsletter templates all over the web. Ashley of Under the Sycamore has a fun tradition for her family – before they pack up their stockings for the year, they each write one “I hope…” note for each member of the family and place it inside the stocking. This note is something that they hope will happen by the next Christmas. For instance, my I hope for Stella would be “I hope you are potty trained”. Then, when they unpack the stockings the following year, they get to read the things that everyone hoped for last year. I can see this being really fun! This is one of those traditions that will require very little work, but adds to the magic of Christmas. Leave a special key on your doorknob so that Santa can get into your house if you don’t have a chimney. Michelle over at The Piccadilly Post even wrote a great poem that she has shared with you to use. Super cute! Wrap up 25 Christmas books and place them under the tree. Each night, have your children pick out the story that matches the day, and read it as the bedtime story. I love that this advent calendar gives the gift of quality time AND reading, rather than more stuff and chocolate (which they get more than their share of on Christmas). Placing the emphasis on togetherness is something I really look for when considering traditions. Leave a package on your doorstep every Christmas Eve filled with goodies you can use that evening – pyjamas for the whole family, a new Christmas book, and a copy of a Christmas movie (or popcorn to go along with an old favourite that you already own). What a great way to spend a snuggly evening together as a family! I saved this one for last because it really did emphasize the true meaning of Christmas and it really touched my heart. Delia Creates shared this tradition that her family does every year – in the morning, before the kids are even allowed to touch the tree, they sit in a quiet place as a family, and each give a gift to God for the year. For instance, my gift could be “I will complete my daily devotionals all the time, not when I’m not too tired”. (Eek… guilty.) Then, the whole family places their gifts in the envelope for the year, and places it in the box for next year. They also get to read the gifts that they gave God in the previous years, pray together as a family, and sing a hymn. Isn’t this an amazing idea? Even if you aren’t religious, you could adapt this to be a gift to your family or loved ones. What about you? Are you looking for new traditions? Do you think you’ll adopt any of these? And do you have any other fun ones that you would like to share? Love these (except the Elf on the Shelf because he creeps me out!). Thank you for sharing. Christy, glad to know I’m not the only one! My friends children LOVE the Elf but I just can’t bring myself to buy one. SO creepy! Thanks for the great ideas! I love the family newsletter in graphic form. How cool would that be framed in an entry way or gallery wall?!! So inspiring friend!! Love this post! Great ideas. Apparently until last week I was living under a rock, because I asked another blogger what elf on the shelf was all about. I really like the first two suggestions! Thanks for those ideas.I really love all of them except for the elf because in the Philippines,elves are considered as evil ones (maligno).Being a Filipina,its a tradition among us to wake up at twelve midnight of Dec.24 and eat together as a family(Noche Buena).We are the one who prepare all of the food(sometimes foods are ordered from restaurants and friends)then we pray together,kiss each other and say “I love you”.Before Christmas eve comes,children have their Christmas carols,its like trick or treating but the difference is,they sing Christmas songs and instead of candies,we give them coins and sometime let them eat inside…We also give gifts to each other during Christmas eve and gifts are usually wrapped. That sounds like so much fun! I love Christmas traditions.